Traditionally, farmers have grown plants in nutrient-rich soil. Now an increasing number of growers rely on hydroponics, which uses a variety of soil-less media in a controlled environment. But which is better—soil or soil-free? Seedstock ventured to find an answer to this question by talking to a farmer, a hydroponics expert, a horticulturist and a chef. They each have different opinions, but one thing is clear: while soil-less growing techniques can offer incredible benefits, we still need dirt. To start, we found a farmer who has utilized (and still does, to some extent) both approaches—Darin Kelly of Good Life Farms, located in Eminence, Indiana. Kelly sees five distinct ways he has benefited from hydroponics—being able to grow year-round, quicker yields, greater efficiency of space, less water usage, and better consistency of product. Kelly, who still uses soil to grow heirloom tomatoes, has grown hydroponically for about seven years. He was curious about this method, and was offered some cheap used hydroponic channels from American Hydroponics. Thus his learning curve began. One of the first things he learned is that growing in soil is much easier than hydroponic growing. He also found that growing hydroponically can quickly become expensive due to cost of equipment and lighting. But despite these challenges, Kelly has embraced hydroponics. Growing in a controlled environment has enabled him to produce food year-round in a region of the U.S. that is hallmarked by frigid winters. He’s also seen faster yields, regardless of season. Bolstering these speedy harvests is the economy of space that hydroponics provides. Even though Kelly’s greenhouse measures only 3,100 square feet, it produces 100,000 head of lettuce each year, plus large quantities of basil and arugula. “That’s incredible for that size of space,” he says. Despite the extra financial outlay associated with hydroponic growing, Kelly says this method requires much less water than growing in soil. Crediting closed hydrating channels for minimal evaporation, he uses about 80 percent less water with hydroponics. Acknowledging that both soil and hydroponics can produce high-quality and low-quality crops, Kelly believes that greater consistency can be attained through hydroponic growing. “Plants aren’t exposed to pathogens, and it’s easier to dial in what the plant needs,” he says. Despite these advantages, Kelly has not written off soil. “I like soil, too,” he says. Bob Hochmuth serves as director of the Suwannee Valley Agricultural Extension Center in Florida, and specializes in vegetable growing. He sees major advantages in hydroponics, especially in regions with certain types of soils. Hydroponics, he says, also allows growers to avoid harmful insects and nematodes, which can result in crop loss. And despite the expense of getting a hydroponic operation up-and-running, Hochmuth says hydroponics attracts many new farmers, most of whom lack access to large plots of land. Hochmuth also gives the nod to hydroponics when it comes to food safety and avoidance of pathogens, such as E. coli and salmonella, that are spread by animal droppings and manure. It’s common knowledge that commodity crops such as corn and soybeans can’t be grown profitably in a hydroponic system. Therefore, according to Hochmuth, hydroponic operations need to specialize in high-value crops such as herbs, vegetables, fruits, flowers and microgreens. Some believe, though, that these hydroponically-grown fruits, vegetables and greens aren’t as tasty as their soil-grown counterparts—but Hochmuth says much progress has been in this area. Even though hydroponics offers its share of positives, Hochmuth points to challenges facing hydroponic growers. Because it’s difficult to come up with the right nutrient program, hydroponics is not well-suited for organic production. Zoning laws can be difficult to navigate. 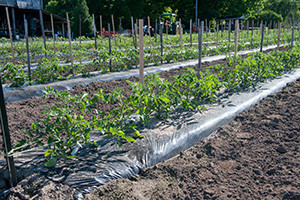 Insurance is often needed for greenhouse structures. And, there is a need for skilled workers who are adept at the technology required by hydroponic operations. Growers and scientists are still on a learning curve in comparing hydroponic growing to growing with soil, according to horticulturist Carl Rosen, who also serves as head of the University of Minnesota Department of Soil, Water, and Climate. Rosen is interested in conducting a nutritional analysis of food grown hydroponically versus food grown in soil. As hydroponics and other forms of controlled-environment agriculture continue to rise to the forefront, he expects a plethora of forthcoming associated nutritional research. Nutrition notwithstanding, Rosen says those who use soil to grow their crops enjoy a much wider margin for error, as well as lower maintenance requirements. Ultimately, Rosen says hydroponics will play a key role in food production, but cannot and will not ever take the place of soil. Erik Oberholtzer, co-founder of local- and sustainable-centric restaurant group Tender Greens, relies quite a bit on hydroponic produce. But in a perfect world, he would prefer food that comes from the earth. But he knows imperfect growing conditions make hydroponics a necessary reality. Tender Greens uses both soil-grown and hydroponically-grown produce, and Oberholtzer points to the benefit of using consistent high-quality produce that comes out of hydroponic farms. However, he hopes people can celebrate both types of growing.